Are your rose bushes not growing well in the Summer? Those Rose bushes you bought in the Spring with those big beautiful blooms are producing fewer and smaller roses than they were just a couple of months ago. You may start thinking you bought miniature roses without knowing it. What do you do? First of all go out and inspect the plants closely. Do it later in the evening when it's not so hot and you will be sure to take time to get a good look. Check the leaves closely for bugs. You may need a magnifying glass to see the little ones if they're present. 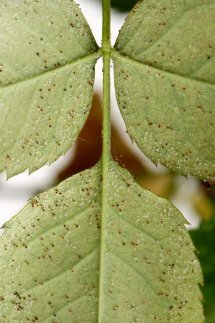 The photos above show the damage Spider Mites do to rose leaves. Get rid of the Mites! Tiny Spider Mites are a big problem in the hot weather. 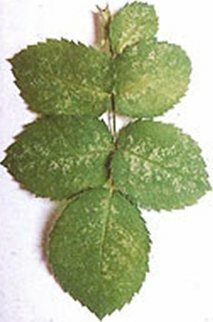 If your roses are not doing so well and you've done everything else you can think of, mites may be present. If so try this first; get your hose and blast them off with a strong stream of water. Spray the undersides of the leaves primarily. Do that every day for three or four days in a row. You'll only lose a few leaves. Any leaves that fall probably would not have lasted long anyway. If, after a week or so, spraying the leaves has not eliminated the mites you will need a miticide (an insecticide specifically for mites). Before you go to the store, check your shelves. Malathion is somewhat effective - try that before you spend more money. If that doesn't work go to the store and read the labels before you make your purchase. You'll want to get the best broad spectrum miticide available. Get the smallest container available - some of it is expensive. Remember that most of the granular insecticides work only as a preventive measure. Once you have bugs you will need to spray to eliminate them - probably two or three times or more - once a week for two or three weeks in a row. Once you get control of the mites be sure to water your plants well during those hot dry days. When the rose bed is dry soak the roots well - let the hose run slowly (any time of the day) into your rose bed until it's well watered while you sit and have a cold glass of tea (or a beer). Overhead watering is not recommended, especially late in the evening. Don't neglect your spray schedule for disease while all of this is going on. Even in hot weather it is a good idea to spray fungicide for black spot and powdery mildew, even on shrub roses. They may be resistant but they're not immune. While you were spraying fungicide once every week or ten days when the weather was cooler, now you can usually drop back to once a month for this task when it's hot. Roses require more frequent fertilizing than most other blooming plants - at least once every four to six weeks with granular fertilizer. If you've been using a soluble liquid fertilizer (Miracle Gro or equivalent) you should use it every other time you water. Do the math and figure what's more cost efficient. Whatever you use, don't let them go hungry. Nearly any good rose food or all-purpose slow release fertilizer is sufficient. If you keep the bugs off your bushes and keep them watered and fed you will be rewarded with gobs of blooms and bushes with healthy green leaves. No, the individual roses still won't be as large as they were in the spring, but they will be much nicer than they were before you applied a little TLC. Note: In Mid August to Mid September. If you trim your plants just a little harder than you have been doing all late spring and summer then fertilize you will be rewarded with a very good fall bloom - almost as nice as the first bloom of the spring.